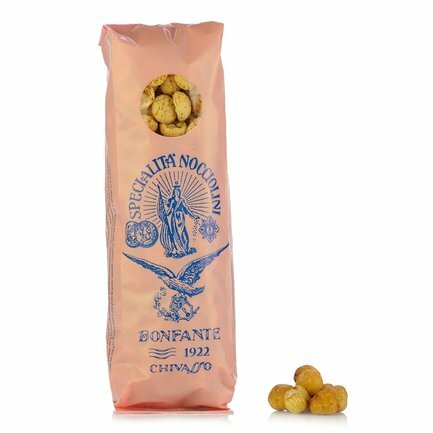 Nocciolini di Chivasso hazelnut biscuits: the originals, in the characteristic red packet and made exclusively with Piedmont IGP hazelnuts! According to tradition, at the beginning of the 18th century a confectioner called Giovanni Podio created these astonishingly good biscuits by skillfully blending just three ingredients - Piedmont hazelnuts, sugar and egg white. Nocciolini di Chivasso hazelnut biscuits, originally called 'Noasetti', were then made even more famous by master confectioners E. Nazzaro and L. Bonfante. It was Nazzaro who went to the Kingdom of Italy's ministry of trade in 1904 to register the brand name 'Noasett'. Luigi Bonfante, for his part, helped to spread the fame of Nocciolini biscuits throughout the country, choosing the red packet that remains a feature to this day. Ingredients Sugar 42%, Piedmont hazelnuts 33%, egg white 25%. Allergens: hazelnuts. For more information on product labels, please contact our Customer Service department. The information on the labels of the products may vary for reasons beyond our control, therefore, there may be discrepancies between the information on the site and that on the products delivered. Please always check the information on the product before consumption or use. With their nocciolini biscuits, Bonfante&Ortalba transformed Chivasso into an historic meeting place dotted with a string of colourful cafés serving these Piedmontese delicacies. Indeed, Luigi Bonfante bought the business with precise intention of promoting Nocciolini biscuits and bringing them recognition beyond the confines of Chivasso: the confectioner rapidly achieved this goal and rose to prominence as a point of reference in Italy and worldwide.